The Peterson Automated Swingblade Mill (ASM) has revolutionised the portable sawmill market, delivering increased and consistent commercial sawmill production with little effort. The ASM makes horizontal and vertical cuts, changes the size or depth of the cut, and removes the previously cut board, all at the touch of a button by the operator. Designed with high production in mind, this commercial sawmill maintains fast and consistent production throughout the entire day. The ASM is operated with a patented Board Remover which returns boards to either end of the mill. This is ideal for single person milling as it allows high production. The board remover also acts as a great stabilizer, which means it increases the rigidity and stability of the blade, making for a smoother cut with less deviation. Using simple set works that don’t take a mathematician to operate, two buttons change the width of cut, and two buttons change the depth. The drive speed is controlled with a lever, which you move forward to go, and pull to bring back. It’s that easy to get incredibly accurate boards with high production. On all ASM and WPF and JP frames, the system allows the operator to lower all four corners of the mill equally from one position meaning more accurate boards. The automated single point winch system, may be upgraded to electric on the WPF. The Peterson JP, WPF, ASM and DWS have all been designed with a track system which allows for unlimited track extensions (extensions available as optional extras). Perfect for when Jeff Sincell milled a 40′ log on his WPF. Peterson blades last for 2-6 years with normal use and maintenance. 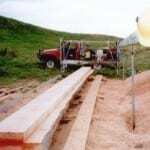 However, some swing blade sawmill owners have been using the same blades for over 10 years! With our blades, maintenance is minimal as our circular blades can be sharpened right on the mill in less than five minutes. Standard with the ASM model, the electric winch allows touch button control of the track height. Not only does it make for faster resetting, but sizing is more accurate due to raising and lowering the tracks at the same time. Peterson’s patented Hi/Lo track set up comes standard on the ASM model. The Hi/Lo tracks allow the operator to either load logs over the track on the low side, or roll logs under the high track, giving the utmost in versatility for mobile or fixed site applications. Petersons are proud to offer 27hp and 30hp Kohler and 35hp Briggs & Stratton Vanguard big-block gasoline options, and a 20hp 3-phase 15kw electric motor. More horse power makes it easier on the engine when you’re cutting hard wood, and also allows you to cut through a log more quickly. When you speak with our sales team, make sure you ask about these high end motor options for a more powerful portable sawmill. These state-of-the-art filters separate clean air from debris and liquids by the design and rotation of the air intake. Petersons have many unskilled operators in remote areas that often forget to clean/change their air filters regularly, but their Kohler or Vanguard Briggs & Stratton motors with cyclonic filters just keep going anyway! Heavy duty cyclonic filters can give up to three times the life of standard duty air filters. To decrease downtime, the Peterson blade can be sharpened while it is still on the mill, in less than 10 minutes, and without having to remove any guards. For your convenience the sharpener is pre-set to fit your blade size. We manufacture the Peterson Portable Sawmill range using quality materials such as hand polished stainless steel and aluminum that make them virtually rust free. This also means the mills are robust in performance, and most importantly – have long-term durability in even the harshest conditions. Because we have faith in our manufacture, and we want you to as well, we offer a 2-year frame warranty on stainless and alloy frames manufactured by Peterson. Petersons mount their sawmill engines higher than other manufacturers for two reasons: firstly, to ensure the air filter intake is further away from the sawdust output. This prevents sawdust build up and overheating of the motor. And secondly, to allow the ability of double-cutting to full depth, without the motor and gearbox restricting the opposite side of the blade. The mill breaks down easily into smaller parts for incredible portability. The ASM Portable Sawmill fits easily into the back of your ute/pick up truck. Setting up the ASM can be done in four simple steps. With two people this takes between 25 – 45 minutes. Breakdown can take less than 30 minutes. Click here to see how easy it is to load the mill on to the back of your ute/pick-up truck. 1. Set up your skids and uprights at each end of the log, relative to the length of track. 2. Place the Lo track and then the Hi track onto the skids/uprights. 3. Install the Center supports/track levelers, electrical control box and cable link. Ensure the tracks are parallel. 4. Wheel in the carriage and place onto the tracks. Remove the jockey wheels. The sawing process can now begin.